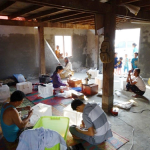 In Lao PDR, a recent national survey on the distribution of malaria showed that 65% of the population was still living in transmission areas (Jorgensen et al., 2010). This study also showed the predominance of Plasmodium falciparum particularly in the southern part of the country was associated with a high risk of transmission. In 2004, an entomological survey showed that Anopheles dirus was an important malaria vector despite its low density and that the role of An. minimus in the transmission varied over time and space (Trung et al., 2004). However, the successive appearance in tropical forest areas of An. minimus during the dry season and An. dirus s.s. during the second part of the rainy season allows a sustainable malaria transmission. More worrying, the recent environmental modifications linked to agriculture and forestry culture (e.g. rubber plantations) may change the status of several vectors, secondary and major, by giving them appropriate ecological conditions to thrive (Osbomer et al., 2007). Insecticide bioassays showed that An. minimus was resistant to pyrethroids in northern Vietnam and Thailand and An. epiroticus was resistant to DDT and pyrethroids in Cambodia and southern Vietnam (Van Bortel et al., 2008). It is possible that the use of agricultural insecticides may be at the origin of the selection of these resistances and so constituting a danger for the implementation of effective vector control strategies. Unfortunately, there is a paucity of data available on the insecticide resistance of the main malaria vectors in Lao PDR. The “hot-spots” of transmission being located in border zones (Thailand, Cambodia, Vietnam…), there is an important risk of dispersal of the population of vectors and the associated aresistances in the surrounding areas. 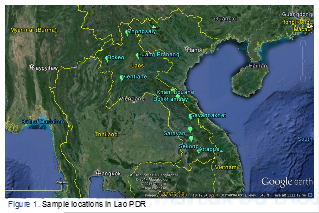 In Lao PDR no data are available regarding the impact of agriculture pesticides on the resistance selection. The only available means of control of the transmission is the use of pyrethroid treated bed-nets, but in Laos, 30 to 50% of the people at risk sleep under treated bed-nets. 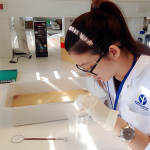 We do not know if the malaria vectors from Thailand and Lao PDR are endophagic or exophagic. For example, An. dirus is known to be exophagic, biting people at twilight at a time of day when that is not protected by treated bed-nets. Hence, it is necessary to understand the vectors biology in Lao PDR and Thailand to adapt the vector control strategies. The risk of distribution of the insecticide resistances of vectors in South-East Asia represents a serious threat to the good results recorded these last years in the control of malaria. It is urgent to identify the distribution, the levels and the mechanisms of resistance of the vectors in the lower Mekong countries with the aim of helping the health authorities to develop more effective strategies of prevention and control of the disease. After consultation with the different partners (CMPE, IRD, KU) and the Lao Ministry of Health, it was decided to study in 10 provinces distributed throughout Lao PDR and 5 districts in Ubon Ratchathani province in Thailand (Figure 1). This enables us to have a global vision of the situation in the country. CMPE already have an important collaboration network with all the health district departments, which is a fundamental parameter for the success of the project. Every village was divided into four zones from a central axis to select at random 1 house by zone. The selected houses were distant from each other by at least 30 meters. For every house a collector was placed inside and another one outside from 6:00 pm in the evening till 6:00 am in the morning on 4 consecutive nights. Mosquitoes were collected with glass tubes (Figure 2). Mosquitoes were also collected overnight with the cow bait collection method. A long mosquito net was disposed around the animal and adult mosquitoes were collected on it (Figure 3). The mosquitoes collected were morphologically identified to the species or complex using microscopes and following the identification keys (Medical Important Anophelines of Southeast Asia) (Figure 4). The Anopheles collected were then separated by species for the insecticide resistance tests. 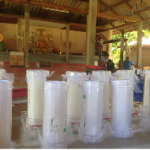 Insecticide bioassay (tube tests) were performed following WHO protocols to measure the insecticide susceptibility of the different mosquito species collected (WHO 2013). Adult female were exposed to DDT (4%), deltamethrin (0.05%), and permethrin (0.75%), the main insecticides used in public health in Lao PDR. Jorgensen P, Nambanya S, Gopinath D, et al. : High heterogeneity in Plasmodium falciparum risk illustrates the need for detailed mapping to guide resource allocation: a new malaria risk map of the Lao People’s Democratic Republic. Malar J 2010, 9(1):59. Trung HD, Van Bortel W, Sochantha T, et al. : Malaria transmission and major malaria vectors in different geographical areas of Southeast Asia. Trop Med Int Health 2004, 9(2):230-237. Van Bortel W, Trung HD, Thuan le K, et al. : The insecticide resistance status of malaria vectors in the Mekong region. Malar J 2008, 7:102.